(ANS - Rome) - The latest video recorded by the Rector Major for the quarterly column "Cari Confratelli, or Dear Confreres" is available online today, Thursday 28 February. Made during the World Youth Day (WYD) in Panama, it is a warm call to the Salesians to live, following the example of Don Bosco, in total dedication to the young. Speaking from the Basilica of Don Bosco in Panama City, right in front of the casket containing a distinguished relic of the Holy of Youth, Fr Ángel Fernández Artime observes the beauty of the youthful show staged during the days with WYD: "What a wonderful opportunity we have! Because our young people, though each with their own difficulties, continue to be close to us, continue to need us." For this reason, according to the needs of each boy and girl, sometimes intervening as a friend, sometimes as an older brother, yet other times as a father, each Salesian is invited by the Successor of Don Bosco "to turn the dreams of God into reality for our young people ... to follow, in a very simple way, a path of Salesian holiness that is fulfilled in daily life." The video "Cari Confratelli" is available on the ANSChannel, in the two original versions in Italian and Spanish, and subtitled in English, French, Portuguese and Polish. As usual, videos subtitled in numerous other languages spoken in the Congregation will also be made available in the coming weeks. 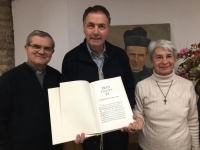 (ANS - Rome) – Published few days ago was the eighth volume of the Don Bosco Epistle in a critical edition, edited by Fr Francesco Motto, the Director emeritus of the Salesian Historical Institute, available at the LAS publisher in Rome. It contains 394 letters from the two-year period 1882-1883, many of which are unpublished - with all the obvious consequences towards a better knowledge of the human and spiritual life of the saint. The recipients of the letters are, as usual, very different from each other: a total of 45% of the letters are addressed to benefactors, a little less than 40% are letters addressed to clerical exponents. The subjects discussed, numerous, are easily identifiable through the series of final indices. The volume differs from the previous ones for various aspects. First of all, because a good 25% of the letters are in French: a French more "spoken" than written, of Italian "flavor" rather than from beyond the Alps. Secondly, the recipient with the most letters is a forty-year-old French benefactor, Claire Louvet, who from this moment on exchanges with Don Bosco a dense correspondence of a spiritual character, practically continued until the saint's death. 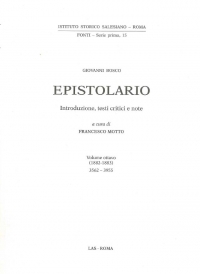 Finally, it is a corpus of letters of which more than half written away from Turin-Valdocco. In fact, over the two years considered Don Bosco was "away from home" for a total of a whole year, of which 6 months in France. These few details are enough to realize the historical-biographical-spiritual value of this correspondence. The thread that binds the letters is the daily life of Don Bosco interwoven with great events (long journeys, the triumph of Paris, the many missionary expeditions, the foundation of new houses, the Patagonian enterprise, the first Salesian bishop appointments, the painful closure of bitter conflicts with Monsignor Gastaldi ...), but also, and above all, his daily commitments: community appointments, private audiences, study, readings, visits to benefactors, and more. What emerges is an all-round whole-hearted Don Bosco who, although physically fragile, gives his all to keep the Congregation alive and solid. It is now walking on its own feet, but Don Bosco remains, albeit from a distance, at the top, a reference point for major problems, a procurator of economic resources essential for development, a defender of his convictions, a vigilant "father and teacher" of young people, of confreres, of correspondents. He is certainly not the "shadow of himself" as has been said; he will only be so later and, in fact, it will be seen in the next two volumes. (ANS - Paris) - The Animation Visit of the Rector Major, Fr Ángel Fernández Artime, in the Province of France-South Belgium (FRB) concluded recently. Gaining knowledge of the realities of Salesian social initiative in these two countries, together with the meeting with the young and the Salesian Family, marked his days in the aforesaid Province. After a brief stop in Rome, from tomorrow, February 28, he resumes travel. In the evening, the Rector Major will arrive in Vienna to begin a new visit to the Austrian Province. As for this previous trip, on the second day full of visits to France, Friday 22, the Rector Major first met the delegates of the "Don Bosco Action Social Network", who presented the breadth of the Salesian educational and social offer in that area. The Rector Major observed and appreciated the role played by the laity, praised the initiatives for the most needy young people and insisted on the importance of giving a clearly Salesian identity to the initiatives. Then, after a meeting with the Provincial Council, he met with Salesian Cooperators and presided over the Eucharist in the church "St Jean Marie Vianney" at the Argenteuil house, on the outskirts of the French capital. Saturday 23 was characterized by a long dialogue with all the Salesians in the Province: the Rector Major celebrated Mass with all of them, spoke on many aspects of the life of the Congregation and listened to the challenges of the Province and visited the Salesian publisher. The afternoon and evening were dedicated to the young people of the Salesian Youth Movement, who first addressed their questions to the Successor of Don Bosco, and then animated a festive evening for him. Finally, last Sunday, 24 February, Fr Á.F. Artime reached Farnières, in Belgium. Already welcomed at the railway station, with enthusiasm and warmth, by children, young people and members of the Salesian Family, the Rector Major then went to the Salesian house, where he presided over the Sunday Eucharist, also flanked by the Provincial FRB, Fr Daniel Federspiel. In the course of the day, marked by a large youth festival, with games and activities for the whole family, he met the children and young people who attend Salesian centers, and finally greeted the local community of the Daughters of Mary Help of Christians. Accompanied by his Secretary, Fr Horacio López, the Rector Major went to Brussels on the morning of Monday 25, from where he took the plane back to Rome. (ANS - Vatican City) - For the students of the Pontifical universities, including the Salesian Pontifical University (UPS), it is certainly good news: in recent days an agreement was signed between the Italian State (Ministry for Instruction, University and Research - MIUR) and the Holy See (Congregation for Catholic Education - CEC) on the mutual recognition of their respective University degrees. The students of all the educational centers will thus benefit from this agreement, as they will be able to carry out their studies in the Pontifical centers or in the Italian ones, knowing they can enjoy the same mutual guarantees. The agreement - MIUR explained in a note - provides for the recognition of all university degrees issued by the Holy See, as happens for any other sovereign State, through a procedure that will take place materially through the Universities, which will evaluate the degrees and will provide for their recognition. Until now, only the titles of "Theology and Sacred Scripture" were fully recognized, while for the other titles issued by the Holy See's university institutions there was no uniform recognition in the Italian national territory, and they could be assessed in the same way as all the other foreign degrees. The agreement is the daughter of the so-called "Lisbon Convention" and the "European Higher Education Area" (EHEA), to which the Holy See has adhered to since 2003. "This was the fundamental step that paved the way for the study of a new agreement arrived to port these days. The equivalence of titles for Theology and the Holy Scriptures remains alive, while the possibility of recognizing the other titles opens up," said, summing up, Msgr. Angelo Vincenzo Zani, CEC Secretary. "I am particularly happy with the signing of this agreement ... As it is evident, this is an agreement that primarily favors the students," added Cardinal Giuseppe Versaldi, CEC Prefect. "We are very proud of the result achieved," said MIUR director, Minister Bussetti. "This is a long-awaited, historic agreement." 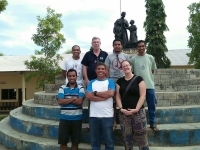 (ANS - Dili) - Less than a year after the invitation from Fr Apolinario Neto, Superior of the Vice Province of Timor-Leste (TLS), two young volunteers from the "Cagliero Project" - the missionary voluntary program of the Australian Province - arrived in East Timor, respectively in Los Palos and Dili. They are Keith Collins, from Perth, and Alasdair O'Brien from Melbourne, who already live in their respective communities and wanted to share their first impressions. "It's an honor to be one of the first volunteers of the Cagliero Project in East Timor. I have certainly received a fantastic welcome and I'm determined to help as much as possible and at the same time learn from the local community. The prenovices of Los Palos are very interested in improving their skills in English and are really curious about Australia. Here there is a real cultural crossover," said one of the two volunteers. "There is a unique link in history between Australia and East Timor and the Cagliero Project is now further strengthening this link," he added. "The welcome at the Don Bosco Centec Vocational Training Center in Dili-Comoro has been unique. Here I help three young Salesians with English lessons. In particular, we make prayers and readings in English to improve the language, so they will be prepared if they want to study abroad," added the other volunteer. Keith and Alasdair then wanted to emphasize how much they were amazed by the great faith of the people of East Timor. "It's striking to see how much faith there is in the Timorese, despite the difficult conditions of life. This is undoubtedly the fruit of constant missionary activity in this land," they said. The Cagliero Project fosters solidarity among the different Provinces and, precisely in the name of this solidarity, the volunteers who are part of it have been sent not only to East Timor, but also to Thailand, Cambodia, Samoa and Zambia. The volunteers of the Cagliero Project are committed to working in the Salesian manner, which means that young people are placed at the center of all the work. This gives young people the opportunity to contribute to the mission of Don Bosco, that is, to serve the poorest and most disadvantaged children and make them become good Christians and honest citizens. The Cagliero Project is also on Facebook. (ANS - Salta) - The project "Amarrando Redes de Solidaridad" (tying solidarity networks), carried out by the Planning and Development Office of the North Argentina Province (ARN), is now eight years old. The ARN project area has now launched the video presentation of "Amarrando Redes de Solidaridad", created in collaboration with the communication team. This year the work of the "San José" Vocational Training Center (CFP) in Salta is being presented. The "San José" CFP was born in 2015 as a new educational pastoral front of the Salesian house "Ángel Zerda", in agreement with the Ministry of Education. The proposal was to answer to the needs expressed by unemployed young people and adults and those with incomplete studies: short courses with immediate work opportunities and certification of skills. In this Salesian center, vocational technical training becomes an instrument and a clear opportunity for educational, social and productive reintegration and, therefore, to improve the quality of personal and family life of these persons. "The Center currently offers young people four courses: plumbing, painting for construction, electricity and advanced electricity. The courses we offer are short and provide a quick exit, so that the young can work immediately," reported Mrs Gimena Carrizo. While the young Daniel Núñez, of the electricity course, says that this "is a great opportunity for us, a complete course for young people who need it. Right now it's a great benefit for me because I do not have a job." The objective of "Amarrando Redes de Solidariedad" is to promote mutual help among the various Salesian houses that belong to the "Blessed Artemide Zatti" Province of Northern Argentina. The activities begin during the school year, and present to the directors, to the heads of the educational centers and to other employees of Salesian works, the needs of the houses that are more vulnerable. In this first phase of awareness-raising a video is shown that presents some of the work that will benefit from solidarity. 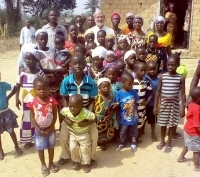 Thanks to the generous dedication of families, throughout the year it is possible to gather the necessary help to strengthen the educational-pastoral proposals of the various Salesian presences that accompany children, young people and adults in situations of risk, through a fixed (optional) monthly amount, which is paid together with the school fees. (ANS - Bari) - "Networking", proposing alternative models and values, recalling politics to its responsibilities, but also being less bigoted and more concrete. These are some actions that could counteract the phenomenon of "baby gangs" and the attraction of criminal organizations at every latitude. The issue was discussed Friday, February 22, at the Salesian center of Bari, during the conference "Baby Gang and Organized Crime: what answers from the educating community?" 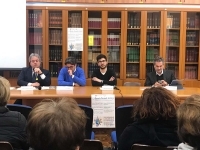 The event, the second in the series of meetings on the theme: "Man called in search of his own dignity" saw the participation of the Quaestor of Bari, police superintendant Carmine Esposito, the lawyer Michele Laforgia, who is engaged in the promotion of paths on legality, and Fr Francesco Preite, Director of the house in Bari. Dr Laforgia listed five challenges to be overcome in order to take minors away from the baby gangs: that of the community, because even "the mafia is a community", which builds an identity for those who are part of it; that of the family, which "can be a resource, but also a huge problem" for those who encounter negative models; prison, which "is not the solution, let alone for minors"; therefore "social services and juvenile justice", which must receive more resources; and the educating community, which "must be open" and where the educator, "must compromise with the world he wants to educate," he concluded. After recalling the beginnings of Don Bosco in prison, Fr Preite called for everyone to work in unity, because in the divisions "crime inserts itself, which is organized." It is important, however, that there is mutual aid between the generations: "The young animators must perform their task well and the adults must accompany the young animators and youngsters." Attitudes of "openness and acceptance" and alternative proposals must be promoted. On this front, politics "must be there, present" and "must give answers." The oratory with its sports, cultural and educational activities must face the challenge, even creating businesses. "Creating businesses with young people is not a sin; we must be less bigoted and more concrete." For his part, the Quaestor of Bari recalled that, faced with the prospects of the easy gains offered by criminal organizations, "we must merge all our energies", to offer an alternative that is primarily "of value, or value-based." "School and family are the cornerstones on which to concentrate the commitment ... Boys must (be able to) verify that there is a possibility of a different life," he concluded. (ANS - Pozoblanco) - On a very important day for the Spanish municipality of Pozoblanco, which celebrated the feast of its patron, the Virgin of the Moon, on February 25, the funeral of an illustrious citizen of the Andalusian town took place: Salesian Fr Antonio César Fernández, victim of a jihadist attack perpetrated about 40 kilometers from the southern border of Burkina Faso. During the celebration, which began at 5 PM, at the parish of Santa Caterina, the statue of the Virgin of the Moon, which had been carried in procession in the morning, was throughout beside the main altar, close to the coffin containing the remains of the Salesian priest. Presiding at Mass was Mgr Demetrio Fernández, bishop of Cordoba, flanked by Msgr Miguel Angel Olaverri, SDB, bishop of Pointe-Noire, Republic of Congo, and many Salesians from Spain, various African countries, from the Salesian headquarters in Rome. Among the civil authorities present, the Delegate of the City Council, Antonio Repullo; the mayor of Pozoblanco, Santiago Cabello; the mayor of Dos Torres, Manuel Torres; the MP Isabel Albás; and the provincial deputy Andrés Lorite. "I want to say a few words of closeness to relatives and Salesians," said Msgr Fernández in the homily. "The Salesians in Pozoblanco have borne fruit, especially the ripe fruit that is Father Antonio Cesar ... As a missionary he made it clear that life can be lived in another way, not only to enjoy it, but also to donate it." There were many words about this missionary that resounded during the homily, but one in particular drew attention: "Today a saint is buried." His holiness was that of daily life, in a life offered fully to the poor, to the young. He lived an "ordinary" holiness, as defined among Salesians. "If in his life he was a great apostle, in his death he was even more so", it has been said. In this way the city of Pozoblanco gave a last goodbye to Fr Antonio César Fernández. "Today we remember Mgr Luigi Versiglia and Fr Callisto Caravario, missionaries and martyrs," observed Fr Teodoro Castillejo, Director of the Salesians of Pozoblanco. "We will never forget Father Antonio Cesar, his incomparable witness of humanity, his dedication, his simplicity, his Salesian disposition, his missionary spirit of predilection for the last to whom Jesus Christ announced and his intimate devotion to the Virgin under the intimate title of Auxiliary. May the good Lord grant that this blood shed on African soil be the seed of new Christians, faithful followers of Jesus Christ." At the end of the Eucharist, the remains of Fr Antonio César Fernández were carried on the shoulders of his Salesian confreres to the Salesian pantheon in the cemetery of Our Lady of Sorrows in Pozoblanco, the place where he was born 72 years ago.